In this series of tutorials on how to customize your MediaPlayer, we have seen how to customize a button in part I. 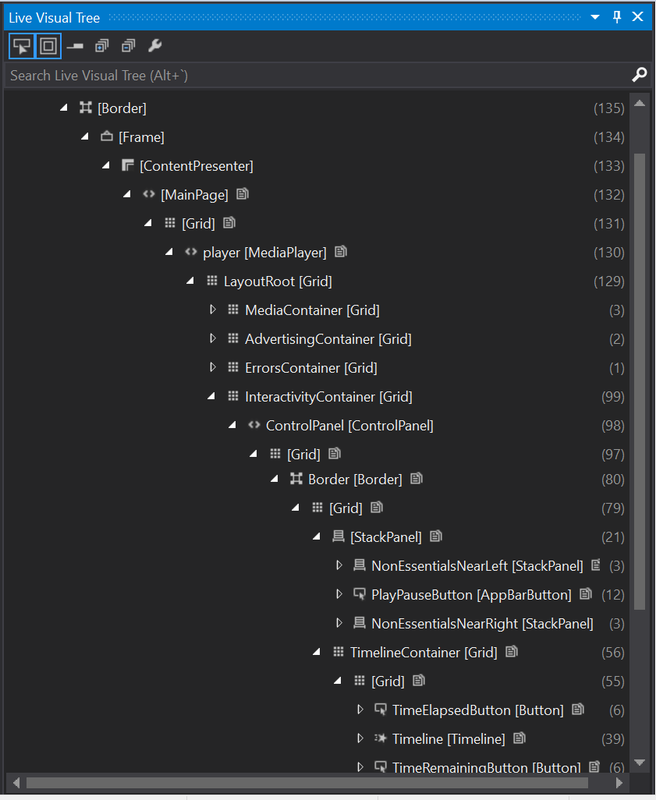 Now we will see how we can use Live Visual Tree and Live Property to make our lives easier when we are trying to design our MediaPlayer element. Before we had no way to edit elements on the fly, we had to imagine what would happen when we changed a property like Margin, Height, Color, BrushThickness etc. Web developers have tons of tools like Firebug for Firefox, Chrome Tools for Chrome and Developer Tools for Edge and IE that allow them to do this, so why not us? 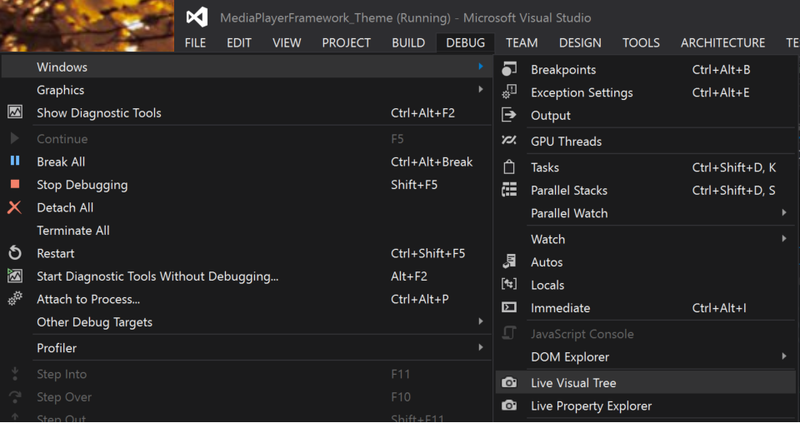 The developing gods (Microsoft in our case) have answered our call and have given us the Live Visual Tree and Live Property Explorer tools which address exactly these issues. I will talk about these two elements and how they can help us develop better and faster. In this tutorial we will implement and design a custom control that will be shown when the video has finished playing. The user will be able to rate the video using this control and we will also move the PlayPauseButton to the bottom left using Live Visual Tree and Live Property Explorer. A custom element in which users can rate the video. 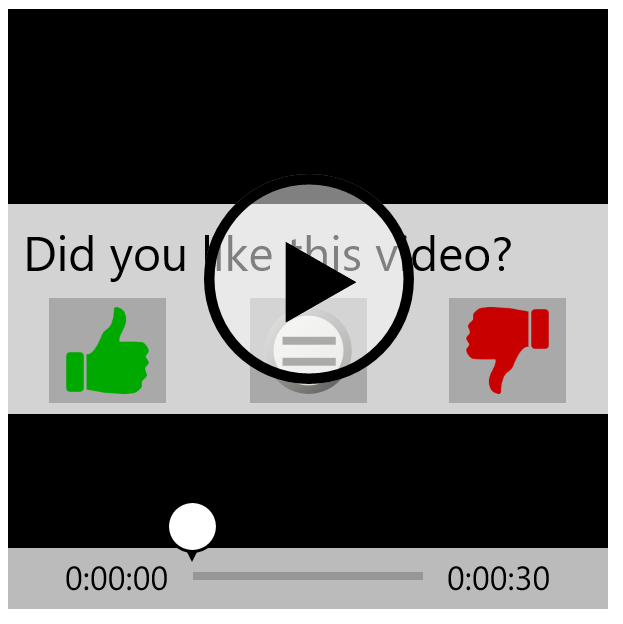 This element will have three different buttons (like, neutral, dislike), which will be shown at the end of the video. 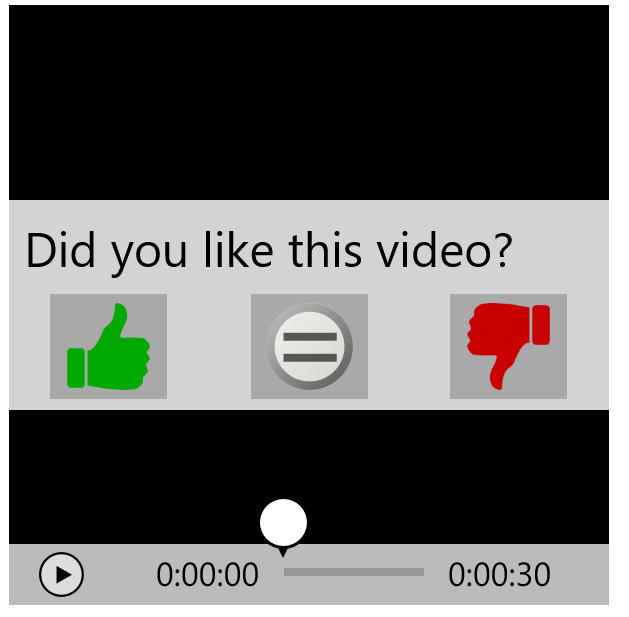 These three buttons will have different actions (rate the video). A PlayPauseButton that have been moved and re-sized. Media Player Framework vsix installed. 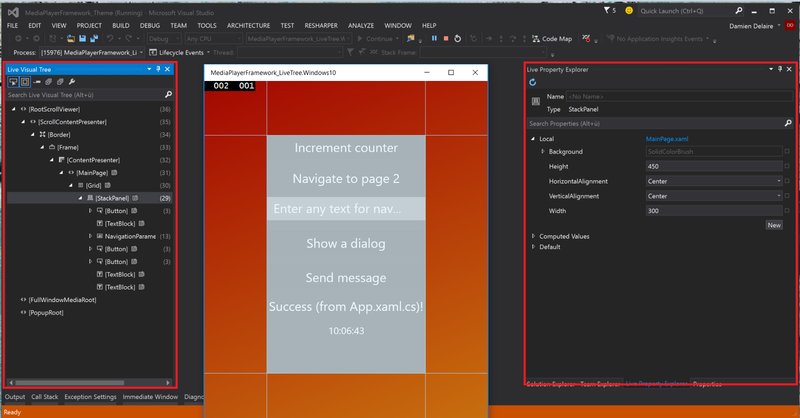 Setting (downloading and referencing) a theme to the MediaPlayer, in this example I will be using Entertainment.xaml template theme. 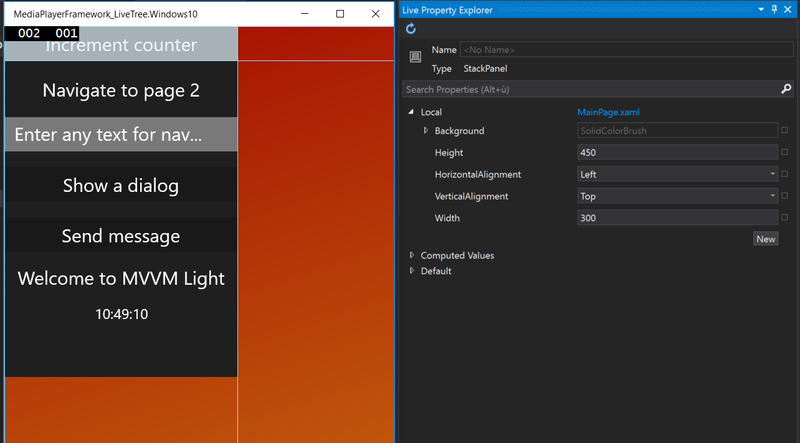 This new tool will speed up your development as you no longer not need to reload the application every time you change something, thanks to Live Property Explorer. 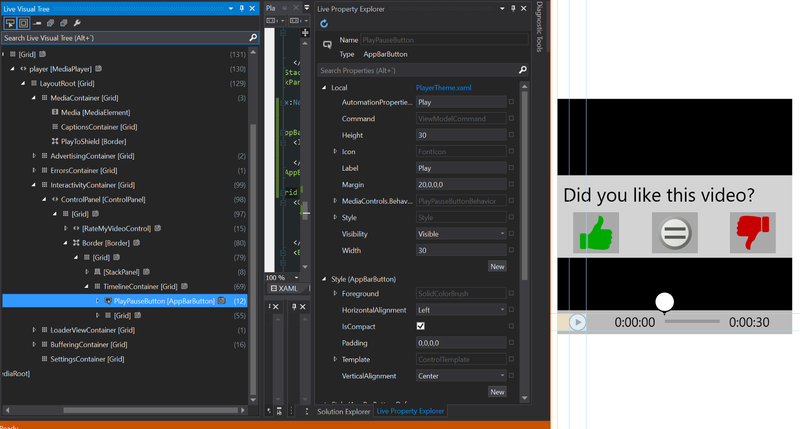 You can find Live Visual Tree under: DEBUG -> WINDOWS -> Live Visual Tree and Live property Explorer under the same path. 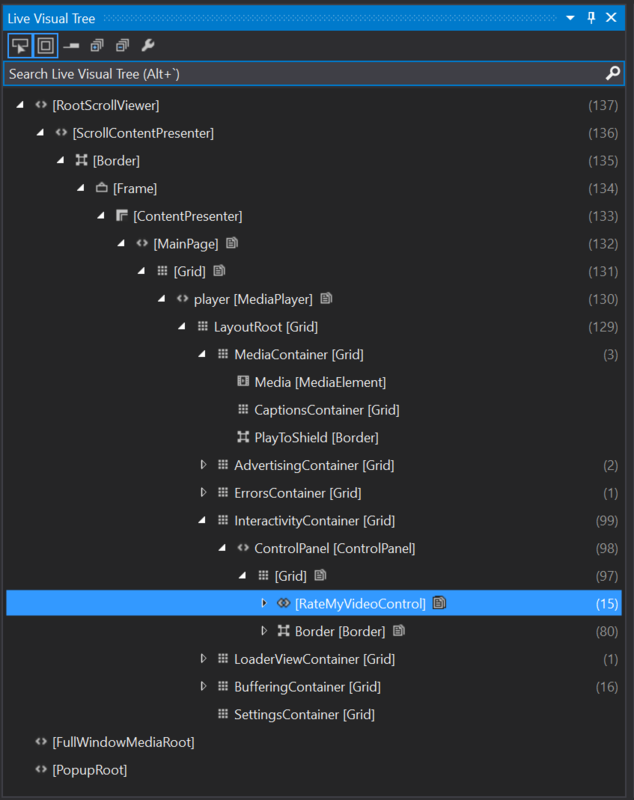 You can see that Live Visual Tree provides information about the number of XAML elements inside each container (here we can see that we have a Grid, a StackPanel and more). Live Visual Tree will show only visible elements, and when an element changes from one state to another you can see that Live Visual Tree is changing at runtime which is very helpful (and AWESOME). Live Property Explorer shows default values for properties, values which were inherited from other controls and the local values of control properties. You can modify local values, here for example we could choose to change the StackPanel HorizontalAlignment=center to Left and we could change VerticalAlignment="Top" to Bottom and the effects would be taken into account without having to reload the app. Live Visual Tree and Live Property Explorer are two great tools that will help you speed up your development time since you will no longer need to recompile your application every time you wish to try a new design or version of a design. (In this part I will not go over how to copy the theme template into the player, for more information on this please read part I). 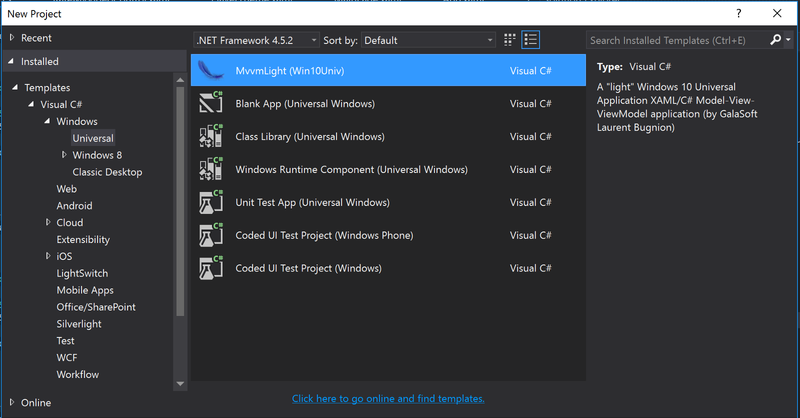 If you don’t have MvvmLight, I can only highly recommend it to you download here. Now that we have created a Windows 10 application, we will need to create the custom control, for this example I will create a folder called Contrls and add a UserControl called RateMyVideoControl. (We deliberately do not name the folder Controls, to avoid namespace clashes). Now we create a Grid element with 3 columns in which we will have 3 images: up vote, neutral vote and down vote. These 3 buttons will be linked to a Command property which will show a different message to the user depending on which button is clicked. Now using Live Visual Tree we will look into the MediaPlayer to see where we can place this component so that the user can see it once the video has ended. We can see that in the InteractivityContainer element we have a Border element that holds all of the controls for the player. This looks like a good place to set our own control. We will then insert our control and will also add a binding to the Visibility property so that we can show and hide our control using a boolean. And lastly in our MainPage we use the MediaEnded event on the MediaPlayer. 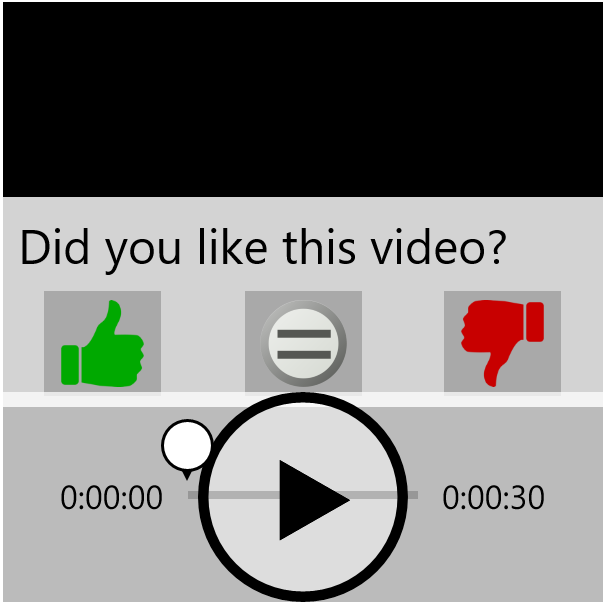 This will tell us when to show the control to the user so that we only show it when the user has finished watching the video. which is not great… On we go to fix this issue! As we saw previously we have a custom control that is shown when the video has ended, however, our play/pause button is hiding it! 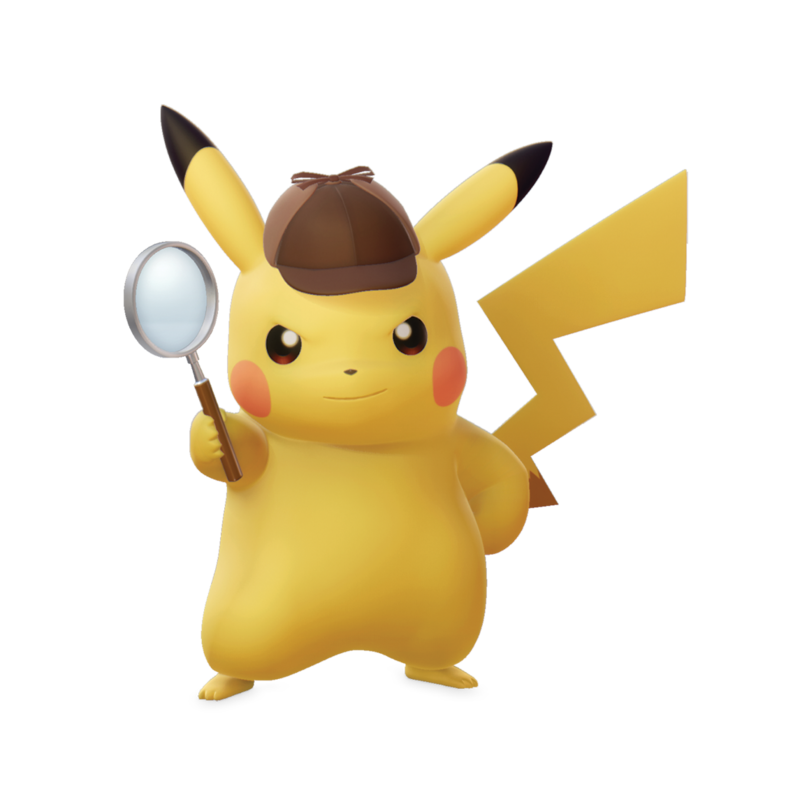 From what we see here we are going to need to search in our player theme for the element named PlayPauseButton. We'll take a copy of it and then comment it out (just in case we want to go back again), and then paste the copy into the element called TimelineContainer. 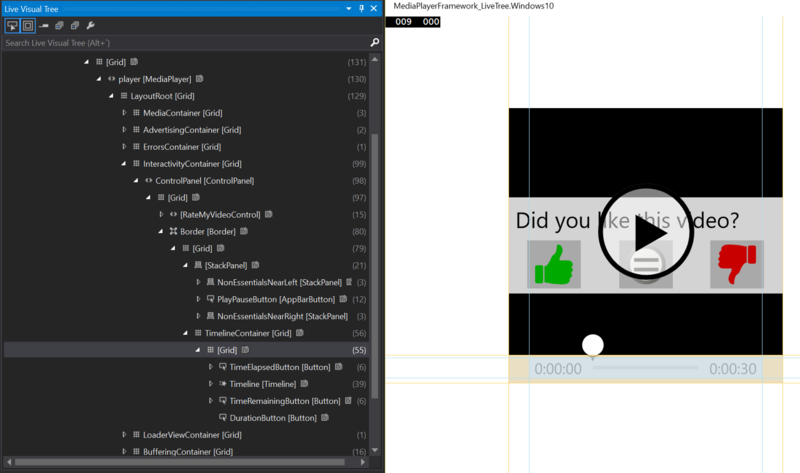 Again using Live Visual Tree and looking for the PlayPauseButton, we can see that it has a Height and Width of 140. We are going to change its Height and Width properties using the Live Property Explorer. You can change the properties Height and Width to 40px and all the sudden it looks a bit better, and if we add more left margin 90px to the Grid which had a left margin of only 30px to start with, we are even better =). And there you have it, you have customized your MediaPlayer again and seen how Live Visual Tree and Live Property Explorer can allow you to gain a lot of time when you are trying to position different elements in your app! Originally published at engineering.dailymotion.com on December 14, 2015.